I strive to minimize my environmental impact on the planet and support local businesses as much as possible. The following points explain some of the ways I try to lead a more sustainable life. 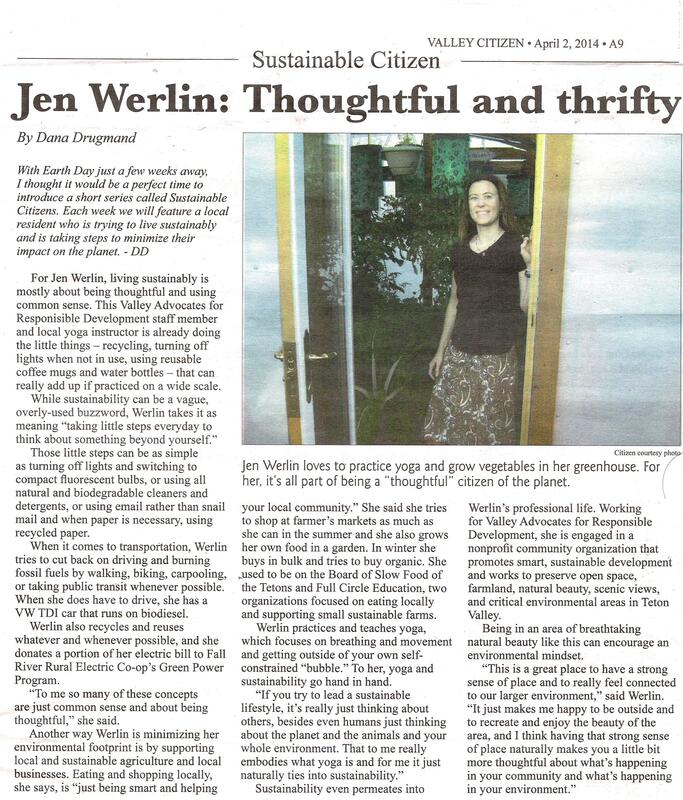 Click here to read a Valley Citizen article from April 2014 about how I try to lead a more sustainable lifestyle. If followed, I believe that the Eight Limbs of Yoga, outlined in the Patanjali's Yoga Sutras, can help lead to a more sustainable society. I try to plan my routes and transportation so that I minimize the use of fossil fuels. Whenever possible, I try to walk, bike, carpool or take the Start Bus in order to meet my clients and teach classes. I also try to drive my beloved VW TDI (that runs on biodiesel) instead of my truck when I need to drive. I try to use recycled paper and soy-based inks in my printed marketing collateral. I use email and my Web site instead of snail mail to disseminate information to my clients. I use and encourage my clients to use reusable coffee mugs and water bottles (e.g., aluminum, stainless steel, BPA free bottles, etc.). Read about the problem of plastic water bottles filling our landfills here. I recycle and reuse whatever and whenever possible and use responsible waste management when disposing my unwanted electronics. Visit Jackson Community Recycling and Teton Valley Community Recycling. I use all natural and biodegradable cleaners and detergents. I turn off the lights and other electronics when leaving the room and use compact fluorescent light bulbs. I donate a portion of my electric bill to Fall River Rural Electric Co-op's ﻿Green Power﻿ Program. I try to buy local products in order to support our local economy and businesses and shop at farmers' markets in the summer. I also use reusable cloth bags for shopping. I am a "Locavore" and encourage local and sustainable agriculture. Slow Food in the Tetons, Full Circle Education and Rural Roots, Inc. are all wonderful regional organizations that support local, organic, and sustainable agriculture and healthy food choices. I believe that you are what you eat! I am a member and volunteer for several regional environmental and community not-for-profit organizations.